mFor designers a key element of your arsenal should be your portfolio. Packed with examples of your latest and best works, your portfolio is a great way to impress and persuade new clientele. Depending on the type of designer or artist that you are, you may not have the necessary web development skills to build your own online portfolio (or maybe you just don’t have the time). Well have no fear, we’ve rounded up some of the best minimal WordPress themes perfect for any designer website. Let’s get started! If you’re looking for a flexible theme that you can use to build a portfolio, blog, shop or a minimal business site then Anders is for you. This theme includes 15 stunning and diverse homepage designs including portfolio, project showcase, vertical slider, agency, carousel, shop and interactive link styles. Choose from 6 header styles, 12 portfolio lists and multiple style blog layouts to create your perfect site design. Perfectly designed for showcasing your portfolio online, Anders has everything you need. Even sections for your team and pricing. Plus the theme is compatible with popular plugins such as WooCommerce, Contact Form 7 and WPML. Total is one of our (WPExplorer’s) most popular and top selling themes of all time. The theme has a very clean/basic design by default that can be easily tweaked via the live Customizer and you can create pretty much any type of site with all the built-in options, layouts and page builder modules available. But what makes this theme one of the best minimal WordPress themes you can buy is it’s 40+ easy start demos, flexible options and developer friendly code. If you need a universal minimalist site, take a closer look at this theme. Ineco is shipped with many variants of pages and functions to meet most users’ needs. Installation of this theme will take you a few minutes only. Ineco supports most popular premium plugins and add-ons, which allows creating content without coding skills. Visual Composer Page Builder with its 40+ custom shortcodes will help you build your site hassle-free. This clean, modern, and elegant theme is a perfect fit for online personal blogs, fashion blogs, travel blogs and more. xPression is loaded with lots of pre-designed pages that will make your online resource stand out a mile. It offers three Homepage styles along with other pages, i.e. : blog listing, blog single, contact, and about. The theme is built using one of the most popular free drag and drop Elementor page builder. WordPress Theme Customizer Options include Live Changes Preview, so you even won’t need to reload the page to see your amendments. Illustrate is truly a theme by designers for designers. Created in collaboration with Blaz Robar, this uber unique theme is perfect for any type of artist. Great features like custom post types, color coded image overlays, and post color palettes (like the ones you see on Dribbble) are just the tip of the iceberg. If you are looking for better performance, cleaner design, faster load speed, and sleeker experience, give Lily a try. You can choose from 10 different layouts for your home page, archive pages, author pages, search results pages, tags, and categories and use various options to style your blog. The theme is very easy to use and powered by HTML5/CSS3/Bootstrap. Sticky navigation will provide your visitors with quick access to any information on your site. Lily is translation ready and includes .pot file, so your blog will be a kind of international resource. Bold and beautiful, Trail is a great option for showcasing your work online. This theme’s big images, clean layout and easy to read typography keeps your readers focus right where you want it – on your work. The theme is also responsive, can display parallax images and comes ready with a filterable portfolio. This theme comes with full compatibility for the Elementor WP Page Builder. With Elementor you get the complete package of widgets for free. Widgets like Carousel, Google maps, etc. are also included. This combined with the Webion theme makes creating websites is easy and effective (plus it doesn’t require any coding skills). Oriana is a creative, top-quality, fully responsive theme. It gives creative people a possibility to introduce themselves in an extraordinary manner. You can configure the majority of Oriana’s aspects like the accent color, Google Fonts, and many others using built-in options. Theme’s demo is super easy to install in one click so you can have a responsive, retina and translation ready site in no time. Perfect for fans of the popular Genesis framework, the Ambiance child theme is the perfect way to build your online portfolio using Genesis. This theme is mobile responsive, includes a custom header, and presents all of your fabulous featured images front and center (making is great for use as a basic portfolio). The Eagle is fully responsive minimal WordPress theme designed for agencies. Its clean design and blog allow any solo professional, agency business, creative agencies, architectural or interior design firm, photography studio, etc. to promote their work or business with ease. One-click demo import functionality, configurable theme options and shortcodes make it easy to quickly change pretty much everything. Koi is a great way to showcase your multitude of works. With a clean and organized grid based layout, this theme is perfectly suited for any creative type of website. Plus this theme comes loaded with 6 free plugins, CSS3 filter effects, portfolio view counter, lightbox support and more. Hazel is a customizable theme with a built-in mega menu and full WooCommerce design integration. It features multiple typographic options with over 800+ Google fonts, custom page options for multipage sites, different portfolio types and styles. Plus it is WPML and translation ready. Moreover, Hazel is shipped with tons of useful visual page builder elements and plenty of pre-configured layouts. Ink is a stunning filterable portfolio template with a useful left-aligned menu. Easy to use and navigate, Ink is also responsive to adjust to any screen size. The theme also features full-screen background images that you can set on a per-page basis to give each post, page or portfolio item a unique design. BookWorm has been designed specifically for authors & publishers. The full-screen web design will help you showcase your works & personal details in a jiffy. The minimal, clean, responsive layout makes it easy to feature recently published or upcoming book releases on your home page. Plus Bookworm boasts features like author profile, previously published book sections, author’s blog, recently published or upcoming book release details, etc. Clean, bold and elegant the North theme is a lovely grid style option for your work. Custom widgets for Twitter, Flickr and Dribble make it easy for your readers to follow along with your current projects. Custom theme galleries and portfolios also make adding images, audio files and videos a breeze. This fully responsive theme is equipped with the Visual Composer Drag & Drop Page Builder as well as the Slider Revolution plugin. And in case your business needs a multi language site, Mindelo also comes with the WordPress Multilingual Plugin just for that purpose. The theme was built on Bootstrap, one of the most popular HTML, CSS, and JS frameworks for developing responsive, mobile first projects on the web. Clean and simple, Spaces is a super minimal WordPress theme with a feature rich portfolio – which is why we think it’s one of the top minimal WordPress themes on the market. 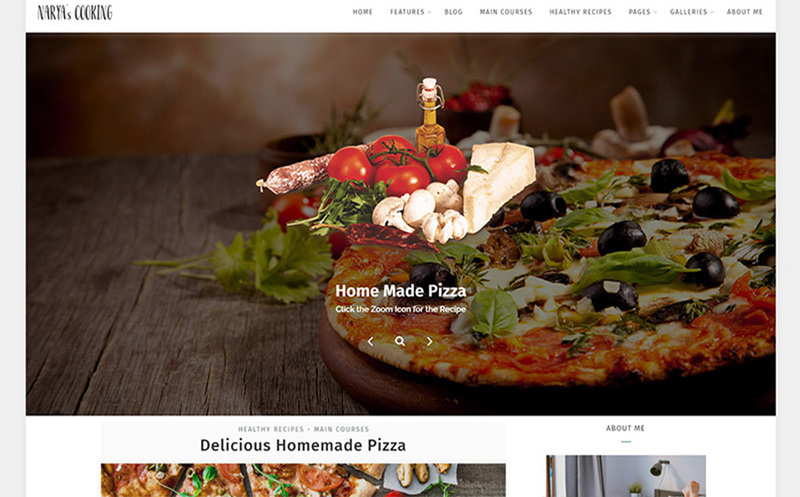 This theme is well suited for designers that might want to also sell their own products, as the theme supports both Easy Digital Downloads & WooCommerce for easy e-shop setup. The Camila theme makes a strong emphasis on text readability. It can be used as a personal blog, magazine or journal and is extremely easy to setup and use. If you don’t want the design to overtake your content, opting for Camila is a great choice as it’s a content-first theme. If you are a photographer, you can create beautiful galleries to show your best works simply without any coding required at your end. And if you are an artist or creative person, you can show off your talents and not flashy design tricks. Photojax is a fun and minimal way to display galleries of your work. Simply add your galleries in posts, and they are displayed on a simple gird-style ajax homepage. This way clients can browse all of your work without having to reload the page (a huge time saver). Narya includes everything to cater to your creative needs: Social Media, eCommerce, Stunning Galleries, Ad management tools, Integrations of Sharing buttons with close attention to detail and styling. Its typography is both elegant and unobtrusive, plus the theme features sliders to present your content in the most stunning way. Want to tweak a small setting to suit your brand’s style? Narya also includes a simple Narya Theme Options Panel for easy changes. Volta is an impressive portfolio option that includes 3 main screen variations. Choose from a content slider, video or image background for when users first land on your website. The theme also includes lovely and minimal portfolios that are fully responsive and retina ready. Neonix is a business WordPress theme ideal for digital agencies, web studios, personal blogs/portfolios, SEO experts, and other digital service providers. It is fully responsive and translation ready, so your audience won’t be limited in terms of device or location. You don’t require any coding knowledge if you want to create a website using Neonix – just use the sample demo create your website within minutes. KEO is a responsive theme great for web agency, photography studio, shop, startup, freelancer, V-card, and others. The theme is built on the intuitive and handy Qoob builder which offers plenty of customization functions for your next project. Build your brand-new website from scratch with the help of the builder and online documentation. Having a great responsive, filterable portfolio is what Reveal is all about. This theme is clean and minimal so your projects stand out, plus the elegant ajax viewing is an impressive added feature. The theme also includes slideshow options, custom widgets, buttons and more you’ve come to expect from the top minimal WordPress themes. 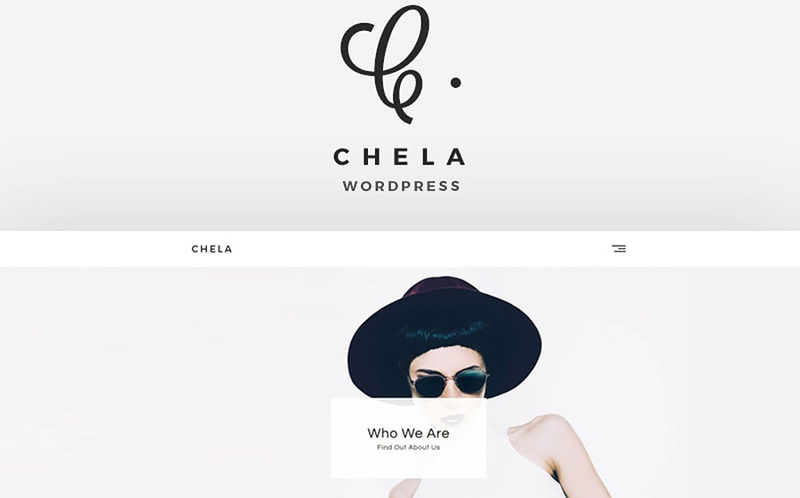 Chela is a super lightweight, minimal & modern theme perfect for agencies and freelancers. It is fully responsive and looks great on all devices. The theme is equipped with Advanced Custom Fields, which is the perfect solution for any WordPress website which needs more flexible data like other Content Management Systems. Plus the included Owl V2/Carousel touch enabled jQuery plugin allows creating a beautiful responsive carousel slider. Grafix is a more professional portfolio with a sleek and minimal design. The theme features a great portfolio for your work, plus it’s easy to make the theme your own with built-in options for custom background colors and images. Moroseta comes with 5 blog layouts and 4 single posts layouts, so you will have plenty to choose from. The custom slider makes it easy to decorate any of your posts, and the live Customizer allows for a smooth customization process. This blogging WordPress theme is also widget ready, so you can extend its functionality with WooCommerce and MailChimp plugins, JetPack, Contact Form 7 etc. Tag is a clean fullscreen style portfolio theme with easy customization options (for color schemes, accent colors, google fonts and more). The included custom widgets, page templates, cusotm shortcodes and styled post formats make adding your content simple. While Inspiro was created with photographers in mind, this minimal WordPress theme is perfectly suited for any designer or artist looking for a stylish and minimal theme. 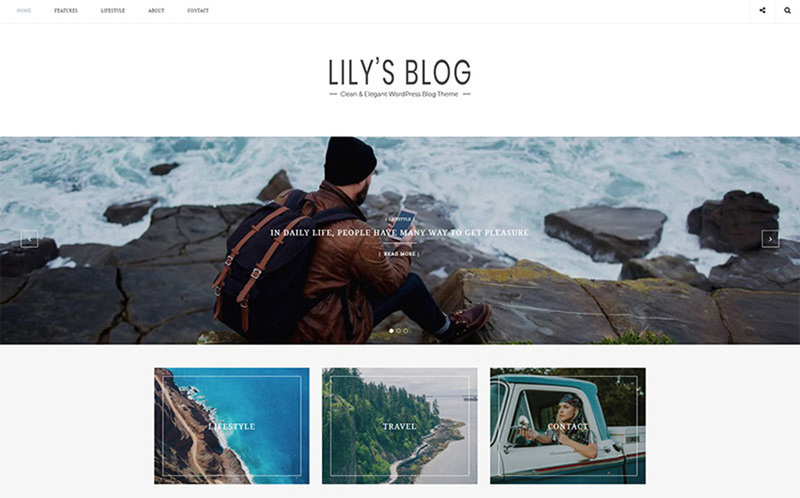 Options for fullscreen slideshows, galleries, and even WooCommerce make this theme a great option. Origin is a simple grid based, no margin portfolio theme that is perfect for showcasing your imagery. The theme is fully responsive, so readers can checkout you work on desktops, tablets and mobile phones. Plus the theme includes tons of options for custom colors, layouts and even ads. There you go – over 30 awesome premium minimal WordPress themes to choose from. Of course, there are some great free themes out there too. If you’re on a tight budget a few you might want to look at include our own Elegant free WordPress theme, Pronto free WordPress theme and Photo free WordPress theme. Or a quick search for “portfolio” on WordPress.org will also give you lots of other decent free theme options. Just remember that with free themes you are not going to get the same great premium features and support that come with a paid theme. Premium themes are well worth the price tag, especially when you’re choosing a theme for your professional online portfolio. If you have anything to add, or if you think we missed a really awesome theme, let us know in the comments below. We’d love to hear which are your favorite minimal WordPress themes!